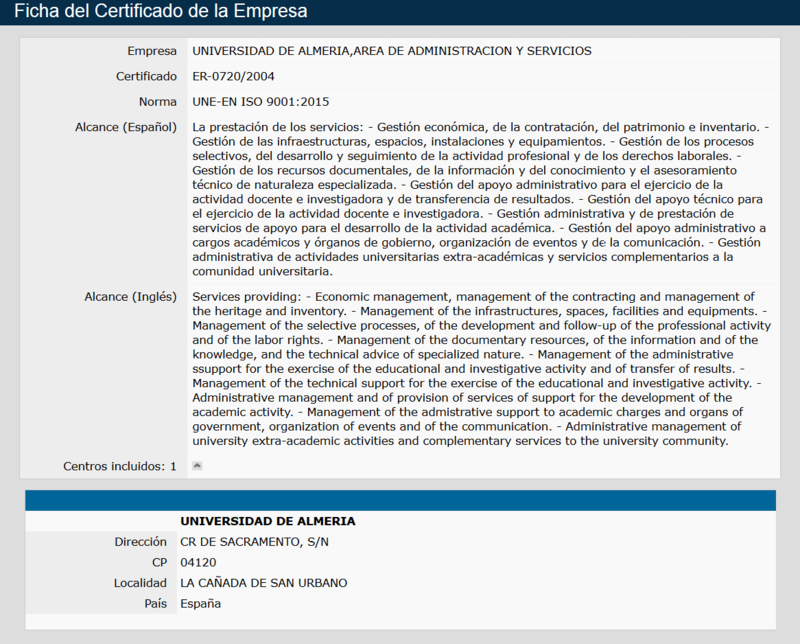 Personal data is only used by the University of Almeria in order to offer services of higher education, research and administrative service management of the university public administration. Personal data will be treated in conformity with current regulations, stored and treated with all security safeguards. Files containing personal data are duly registered at the Data Protection Agency. Ctra. Sacramento s/n, La Cañada de San Urbano, 04120 Almería (España). Users will guarantee that the information and data they are transmitting by using this Website are true and authentic. Users will be obliged to maintain information and data up to date so they conform to reality at any time. Users will be responsible for any false or incorrect expression produced as a consequence of the information and data they offer, as well as for any damage caused by said information. Registered data may be used for statistical purposes, incidence management, and for the purposes for which the data has been compiled. By offering personal data to the University of Almeria, users declare that they fully and unquestionably accept said data to be treated by the University. The University of Almeria is obliged to keep the personal data treated secret and it declares its intention of undertaking the necessary technical and organization measures to guarantee the safety of personal data and avoid their alteration, loss, unauthorized treatment or access, in the light of the state of technology, the nature of the data stored and the human, physical or natural risks which they are exposed to. Further information from may be obtained about treatment of personal data at the University of Almeria and other matters about rights of users and obligations of personnel at the Data Protection and Computer Safety Commission Website.